Modern offices are a tough place for those of us with hearing loss. The trend of late has been for "open plan" offices, basically large open spaces stuffed full of desks, with no dividing walls between desks or areas. This is supposed to improve collaboration amongst employees as everyone can talk and see everyone else, the jury is out as to whether an open plan office improves anyone's working life at all, but one thing is for sure: it's a nightmare if you have hearing loss. Years back the office trend was for everyone to be in cubicles like each person had their own little walled-off area with just them and their desk in it, this layout was widely hated but it would have been a much easier environment to hear in. 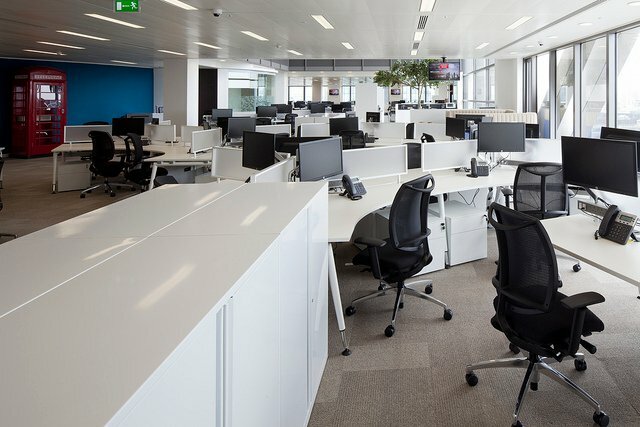 Offices have a lot of background noise, with different groups of people talking and general noise like phones ringing, chairs scraping, clattering on desks, computer noise etc. I found it really hard to concentrate on work with all the background noise, add to that the fact that I'm trying to ignore all the noise but also trying to remain alert to anyone talking to me - that might be easy for someone with good hearing to do, I found it very hard, either I was paying attention to all the noise or none of it, which meant people had to get my attention before speaking to me, either by coming over to my seat or waving at me. Meetings are also a source of grief for the hearing impaired. The bigger the meeting room and the more people that attend, the bigger the problem. Meetings have people talking from all angles and from differing distances, sometimes people over loudspeaker phones and multiple talkers at the same time. Trying to keep up with meeting conversations can be exhausting if you are struggling to hear, I've often found myself drifting out of the conversation and thinking, "If someone asks me a direct question now, I am doomed". How can you make your office life a bit easier? Let's take a little deeper look at those concepts. Tell everyone about your hearing problem. This is number 1 on any advice on how to make your life easier when you have hearing loss. If you tell everyone in the office you have a hearing problem then you immediately give yourself a headstart. You will be surprised how accommodating people will be, most people are happy to get your attention before speaking and repeating what they said when needed. Remember: you are not your hearing loss. You have skills, assets and positives that you are bringing to your job, don't let your hearing loss take away from that, make it a much smaller issue by making sure everyone knows about it and deals with it. Another thing: people forget. My hearing loss is a big thing TO ME, I don't expect it to be more than a passing thought to anyone else. If someone forgets about your hearing problem, remind them, they have their own stuff going on in their life, don't expect them to remember what you've got going on as well. It's especially important to let your superiors know about your hearing problem, i.e. the people deciding if you get a pay rise or not - make sure they judge you for your abilities, not your disability. A good employer should be willing to help you with the things you need to get your job done to the best of your ability. The one thing I always state to any employer is that I don't use a desk phone, it is just so much more difficult for me to hear on a desk phone than it is on my mobile/cell phone. When I use my cell phone I can use my ReSound Phone Clip+ and have the phone call played directly into my hearing aids for a much louder and clearer conversation. This is the best way for me to take calls and I make sure any employer knows that. I've never had an employer who has had a problem with this, I think if you say, "look, I need this thing because it makes it easier for me to do my job" then they are happy to provide it, after all, they are paying you money to do a job, they want you to do it as best you can. Location. Location. Location. Where you sit in an office can make a big difference to how well you hear, especially in a large open plan office. As I said before, offices tend to be noisy places with sounds coming from all angles, to make it easier for you to hear it is best to minimise the unnecessary noise around you - one way to do this would be to sit with your back to a wall so that there's no noise behind you, getting a corner seat would be even better, blocking off two directions of noise. Getting a good seat is often difficult, people don't like to move once they've found "their spot", again, it's worth mentioning to your employer to see what they can do. Times are a-changing, not so many people use the phone for communication anymore, which is great news for us. Email is the obvious alternative, if I'm initiating a conversation with somebody at work I will almost always email them, I will never call them, I find if you email someone first they will usually stick with email throughout but if you call them first then the phone remains the communication device. Sometimes people will ask to call as its better for them, when that happens I explain about my hearing loss and say that it could be an issue but let's try a call and see what happens. Again, if people are aware of your hearing loss then it's no drama if it becomes a problem. Don't let other people dictate the terms of communication to you if you are more comfortable with email then push them to email, if they want to talk/call then let them know the possible problems with that. If I am in a large meeting room where it is going to be difficult to hear I try and sit in the centre of the table so that I'm as near as I can be to most of the people. If there is someone I know is a real quiet talker I try and sit near them. If you are the person setting up a meeting, book a small room, better to have everyone squashed in and sitting close to you! Most hearing aids have a volume control and some changeable programmes, use them to your advantage. Don't be scared to reach up to your ear and press the volume up button if things are too quiet, better still, install the smartphone app for your hearing aids that lets you control the settings via your phone, its much more discrete, especially as most people spend meetings looking at their phone and/or laptop anyway. All hearing aids these days have "settings" or "programmes", this is something your hearing aid provider can set up and it means you can have different setups for different environments. For example, a hearing aid can pull in sound from a 360-degree radius all around you in equal measure or it can focus 100% on the person talking directly in front of you, or focus on a 90-degree angle in front of you, etc. They can also be programmed to expect different levels of background noise or to be extra loud and so on. Basically the point is this: your hearing aid provider can set up your hearing aids to have a programme specifically for meetings and this may help you hear much better than your normal everyday hearing aid setting. If you are having a problem in meetings then explain that to your provider and get them to set up a new "meeting programme", you'll need to explain the environment to them so that they can set it up best for you. Hearing aids are very smart these days and "just work" most of the time, but if you need something specific for a specific meeting room or office environment then you can have that too. Every hearing aid manufacturer offers remote microphone and Bluetooth phone connectors with their hearing aids. These are immensely useful to me in the office. I take all phone calls on my cell phone and have the call relayed directly in to my hearing aids via Bluetooth, this results in a much clearer and easier-to-follow phone call, before I had Bluetooth-enabled hearing aids I was reluctant to make calls as they were almost always problematic, but now I am much more relaxed about the phone. I also occasionally use ReSound's Multi Mic remote microphone if I am in a presentation or somewhere else where the speaker is some distance away - the remote mic means that I can leave the microphone device near the speaker and have their voice relayed directly into my hearing aids via Bluetooth. This sounds like the speaker is sitting right next to me and singing sweet nothings into my ear, the audio is clear and sharp, it makes a potentially difficult listening environment into a very easy one. I've worked in many offices over the years and they are consistently the most difficult places I have had to hear in, I'd often find that I'd spend the working day having to really concentrate to stay in the game but at home and elsewhere I could hear comfortably. Open plan offices are not our friends but you can make your life easier by taking control of your hearing loss, telling people about it and setting up your working environment as best you can so that you can do your best work without your hearing being a problem. Don't let your hearing loss stop you from doing your best work.